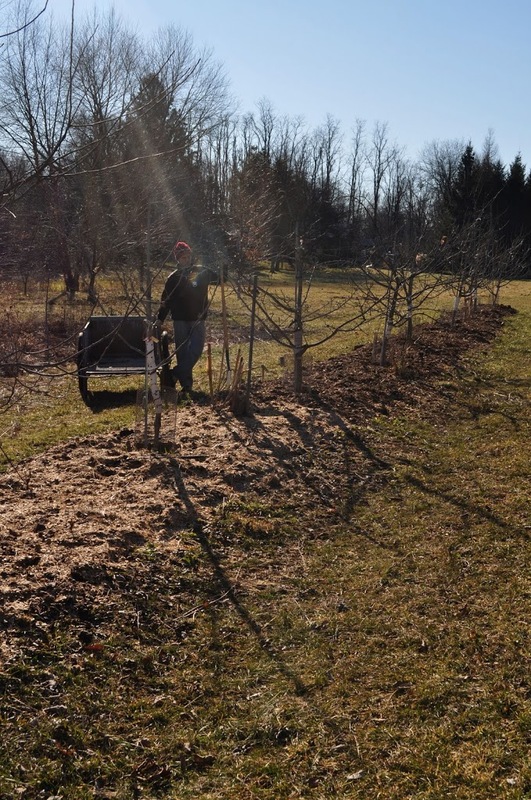 Mulch is one of those things in life that you can’t have too much of — if you’re a gardener — so I forked the neighbor’s wood chips into my garden cart and hauled five loads over to my apple trees. The apples would be thankful because, as dwarf trees, they need the best possible soil conditions to keep them growing vigorously, vigorously for dwarfs, that is. Also, manure left on top of the ground in winter, especially manure left exposed to the elements, loses some its goodness as its nitrogen evaporates into thin air. Barring snow, not in the offing as of this writing, the wood chips blanket should minimize that loss. Some people tout ramial wood chips as promoting beneficial fungi in soils, allegedly to the liking of trees — such as apples — naturally found in forests. But when any old kind of wood chips — any organic materials, for that matter — is laid atop the ground, it is worked upon by a naturally orchestrated sequence of microorganisms, fungi included. Yes, fungi are promoted, but so are bacteria and other organisms, standing ready to gobble up the more readily accessible foodstuffs after fungi have finished with them. No need to use special kinds of woods chips for special effect. What, no snow? I am inspired as I have mulch to spread and time now. Today, gardening chores inspired by Lee. Thanks! I agree that mulch can be a good thing, but I don’t recommend spreading large amounts of *leaf mulch*as I did a few years ago. It was an open invitation for voles to move in. I’m still dealing with the problem. Trapping helped some, but the when our neighbor got an outdoor cat, we noticed a definite decrease in the vole population. 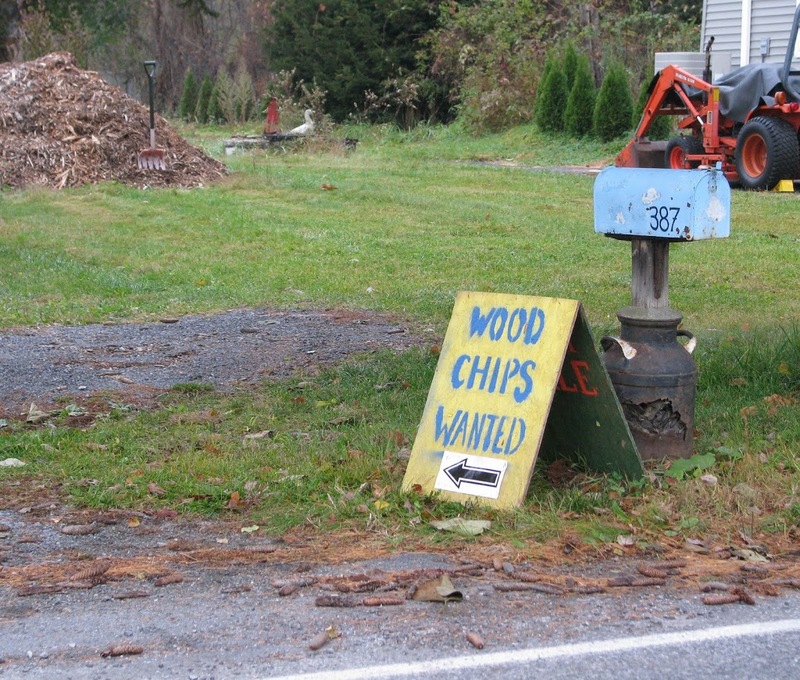 What’s the best way to find free wood chips? Having read the original paper from Laval University, I am familiar with the arguments favoring use of ramial wood chips. Yes, they are higher in nutrients than chips from larger branches, especially with respect to N. But I like to feed and mulch my plants with a variety of organic “waste” products, thus providing a spectrum of nutrients, so am not overly dependent on only wood chips. Furthermore, the N in larger branches is eventually released into the soil, admittedly more slowly than from smaller chips but there’s no rush to digest them except initially in poor soil. Wood chips are a readily available waste product that’s a valuable garden resource. Unless you make your own chips, you can’t be bothering arborists telling them you want only ramial wood chips. It’s all good, very good. That Laval University paper on wood chips hardly proves their benefit. I considered mostly a promo for racial wood chips. I take issue also with their recommendation against the inclusion of chips with leaves, allegedly because that will promote undesirable bacterial growth. Although this concept gets a lot of press, I have yet to see proof that manipulation of the amounts of bacteria and fungi in a soil actually having a direct affect on plant health.